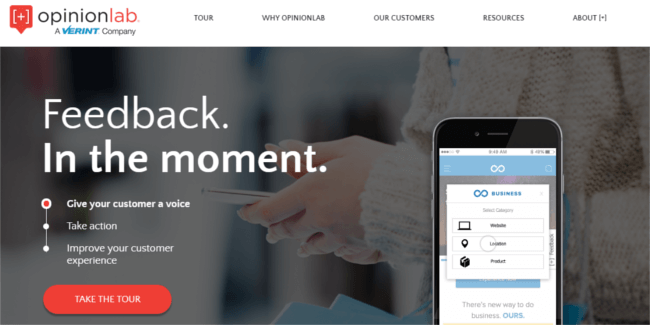 OpinionLab is a popular Voice of the Customer (VoC) platform that collects customer feedback via standard surveys. While this tool was initially focused on website feedback it is now positioned a lot broader. For example, surveys can be used to gather feedback from other (offline) channels such as contact centres and shops (hence its marking as a more traditional VoC tool). So let’s look at some alternatives. Here is our list of the top 10 alternatives to and competitors of OpinionLab. Mopinion is a customer feedback tool that collects and analyses website and mobile feedback (using a mobile SDK) in real-time. With it’s easy-to-use interface, users can build, design and configure feedback forms however they like. It is also an option to target these feedback forms to specific groups of online visitors and gain insights into why they are not converting. This is done using advanced triggers that are set off based on digital visitor behaviour. There are three unique ways in which users can deploy feedback forms: modal, slide-in and embedded on the page. Once it has been collected, feedback items can be visualised in customisable dashboards and charts for advanced analyses. Additionally, digital teams can share and take action on these feedback items in a timely manner with the help of smart alerts. UseResponse is a considered slightly more inexpensive variant of UserVoice. It has the same focus as UserVoice – with product management & roadmapping being the number one priority – however, this provider offers a version you can host yourself with open sourced code. You only pay a one-time fee. Besides feedback and a forum, the package also includes a live chat client. It also includes a help desk with ticketing and a knowledge base software. 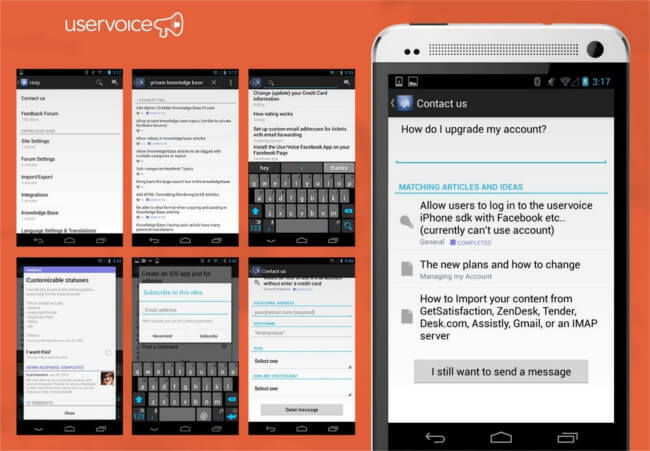 UserVoice is often used by marketers for the generation of and voting on ideas for new features of the website or app. Its focus lies in product management, providing users with the feedback they need to prioritise their product roadmap. With applications such as “search-as-you-type”, you can immediately see whether another visitor has also experienced the same problem the moment you give feedback. This makes it easier to vote for it or to respond to it, so double discussions in your forum are avoided. Also UserVoice offers several options for forum moderation and management. 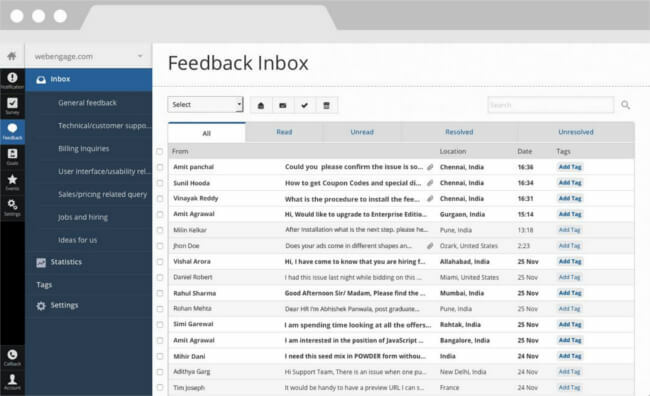 WebEngage is a cost-effective customer feedback software that offers a feedback form and survey builder. This software can also be used to trigger the feedback forms depending on the visitor’s click behaviour. In addition to the survey widgets, WebEngage also offers possibilities to send out notifications on the website or in a mobile app, for example to highlight a promotion instead of a feedback request. Note: this tool is intended mainly for collection purposes and does not offer much in terms of analysis, e.g. text analysis. Google Forms is a free online survey software and questionnaire tool that allows its users to quickly and easily put together surveys via a drag & drop interface. In terms of design, these surveys can be entirely customised. The tool provides you with real-time response info and charts. This data can also be connected with other Google products. Medallia for Digital is a key component of Medallia Experience Cloud. This solution captures feedback on websites and mobile website and in-app and integrates it with offline data from contact centers, retail stores and several other touchpoints. The software also makes use of powerful AI-based text analytics, role-based reporting and real-time alerts. BUT, some might say it’s a rather expensive solution. Wootric is an AI-powered survey tool which uses single question micro-surveys. Surveys include metrics such as Net Promoter Score, CSAT and Customer Effort Score. Users can also provide an explanation for their score in open comments. Installation is quick and easy and data (once collected) is available in a live dashboard. 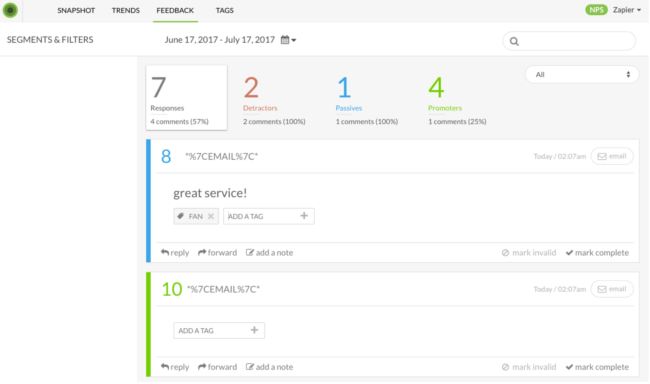 By way of a drag-and-drop editor, Feedbackify allows users to easily create feedback forms themselves. Installation is also very easy. All you have to do is copy and paste the code they provide you with into your website’s HTML and it’s ready to go. Your visitors can provide a rating as well as submit comments, including compliments and suggestions. Within this tool, you can view all feedback received in a dashboard in real-time as well as filter by category and sub-category. Unfortunately this tool doesn’t offer advanced reporting or text analysis capabilities. But if you’re going for cheap and simple this is a great tool for you. I hope this article has provided you with some guidance in terms of choosing an alternative VoC tool to OpinionLab. Knowing how to choose the right tool(s) for your business is still quite difficult for many digital teams. This is attributed to the fact that VoC tools are very diverse in purpose. They use various collection techniques, collect different forms of feedback, report differently and provide different kinds of insights for the user. Choose wisely!